Sorry we made a mistake with the time on the flyer. 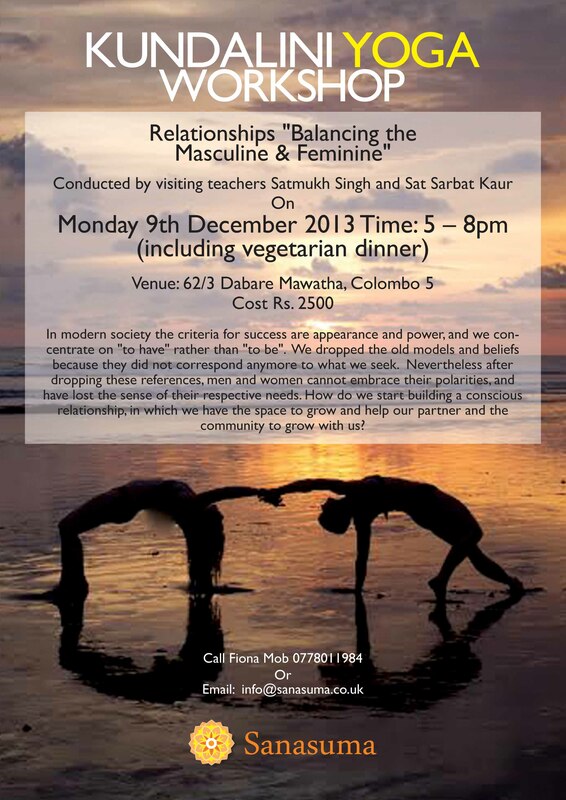 The Workshop on relationships will be on Monday 9th Dec from 6 – 8pm with dinner included afterwards. Look forward to seeing you all. We have places for 10, please email us on info@sanasuma.co.uk or call Fiona on 077 8011984 and we will send you a registration form. Please join us for special workshop on relationshps which will be taught by two wonderful visiting teachers Sri Lanka from China Satmukh Singh and Sat Sarbat Kaur. See below for some background on the these two lovely teachers. Sat Sarbat is a KRI certified Kundalini Yoga teacher and teacher trainer who expanded her knowledge by following several other training around Yogi Bhajan’s teachings, such as Sat Nam Rasayan Healing, Numerology, Conscious Pregnancy, and Children Yoga. She met Yogi Bhajan in 2001 and was deeply touched. Since then, she has been teaching the KY teacher training Level 1 in Austria, France and started to teach it in Asia in 2011. She has taught in the Level 2 module on Conscious Relationships for the Kundalini Yoga school ANS in Europe and since 2012 is part of the international team of ANS level 2 teachers. Satmukh Singh’s connection with Asia started in 2006 when he came to Shanghai to learn Chinese! As a certified Ashtanga yoga (attested by Yoga Alliance) and Kundalini yoga teacher (attested by the Kundalini Research Institute ), he started to teach regular classes in Kunming (Yunnan) and then moved to Dali to create a Kundalini Yoga Center, and Yoga-Gaia which aimed at promoting Kundalini yoga as taught by Yogi Bhajan in China. Satmukh Singh travels regularly between Europe and Asia to propose various Kundalini yoga workshops, and also organize and teach in Kundalini yoga teacher training (France, Austria, China, Australia). He also designs and develops creative Kundalini Yoga programs in the mountains as Yogatiltude to bring participants from different backgrounds and cultures into an individual transformative process within a group. A Pauri of the Japji Sahib illustrates his motivation and inspiration to teach around the world and especially around China: Ai panthi sagal jamati man jitai jag jit. Make the all humanity your spiritual family; conquer your own mind, and you will conquer the world. Please call Fiona on (M) 0778011984 or email us on <info@sanasuma.co.uk> to book your place.